Stanford researchers have developed an ultrasensitive, highly flexible, electronic sensor that can feel a touch as light as an alighting fly. Manufactured in large sheets, the sensors could be used in artificial electronic skin for prosthetic limbs, robots, touch-screen displays, automobile safety and a range of medical applications. By sandwiching a precisely molded, highly elastic rubber layer between two parallel electrodes, the team created an electronic sensor that can detect the slightest touch. "It detects pressures well below the pressure exerted by a 20 milligram bluebottle fly carcass we experimented with, and does so with unprecedented speed," said Zhenan Bao, an associate professor of chemical engineering who led the research. The key innovation in the new sensor is the use of a thin film of rubber molded into a grid of tiny pyramids, Bao said. She is the senior author of a paper published Sept. 12 online by Nature Materials. 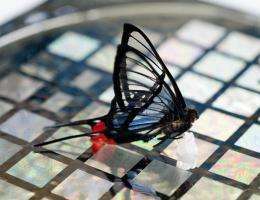 Researchers can measure the pressure from a butterfly registered by the sensors. "We found that with a very thin continuous film, when you press on it, the material does not have room to expand," said Stefan Mannsfeld, a former postdoctoral researcher in chemical engineering and a coauthor. "So the molecules in the continuous rubber film are forced closer together and become entangled. When pressure is released, they cannot go back to the original arrangement, so the sensor doesn't work as well." "The microstructuring we developed makes the rubber behave more like an ideal spring," Mannsfeld said. The total thickness of the artificial skin, including the rubber layer and both electrodes, is less than one millimeter. The speed of compression and rebound of the rubber are critical for the sensor to be able to detect - and distinguish between - separate touches in quick succession. The thin rubber film between the two electrodes stores electrical charges, much like a battery. When pressure is exerted on the sensor, the rubber film compresses, which changes the amount of electrical charges the film can store. That change is detected by the electrodes and is what enables the sensor to transmit what it is "feeling." The largest sheet of sensors that Bao's group has produced to date measures about seven centimeters on a side. The sheet exhibited a great deal of flexibility, indicating it should perform well when wrapped around a surface mimicking the curvature of something such as a human hand or the sharp angles of a robotic arm. Bao said that molding the rubber in different shapes yields sensors that are responsive to different ranges of pressure. "It's the same as for human skin, which has a whole range of sensitivities," she said. "Fingertips are the most sensitive, while the elbow is quite insensitive." But that density allows the sensors to perceive pressures "in the range of a very, very gentle touch," Bao said. By altering the configuration of the microstructure or the density of the sensors, she thinks the sensor can be refined to detect subtleties in the shape of an object. "If we can make this in higher resolution, then potentially we should be able to have the image on a coin read by the sensor," she said. A robotic hand covered with the electronic skin could feel a surface and know rough from smooth. That degree of sensitivity could make the sensors useful in a broad range of medical applications, including robotic surgery, Bao said. In addition, using bandages equipped with the sensors could aid in healing of wounds and incisions. Doctors could use data from the sensors to be sure the bandages were not too tight. Automobile safety could also be enhanced. "If a driver is tired, or drunk, or falls asleep at the wheel, their hands might loosen or fall off the wheel," said Benjamin Tee, graduate student in electrical engineering and a coauthor. "If there are pressure sensors that can sense that no hands are holding the steering wheel, the car could be equipped with some automatic safety device that could sound an alarm or kick in to slow the car down. This could be simpler and cost less than other methods of detecting driver fatigue." As Bao's team continues their research, they may find applications not yet considered as well as other ways to demonstrate the sensitivity of their sensors. They have already expanded their stable of insects beyond the bluebottle fly to include some beautiful, delicate looking - albeit slightly heavier - butterflies. But if the researchers wanted an even more ethereal demonstration, could the sensors detect the bubbles rising in a glass of champagne? "If the bubbles coming out from the champagne impinge onto the pressure sensor, that might be possible," Bao said. "That would be an interesting experiment to do in the lab." Randall Stoltenberg, graduate student in chemistry, Christopher Chen, undergraduate student in chemical engineering, Soumendra Barman, graduate student in chemical engineering, Beinn Muir, former postdoctoral researcher in chemical engineering, Anatoliy Sokolov, postdoctoral researcher in chemical engineering and Colin Reese, former graduate student in chemical engineering, also contributed to the research and are coauthors of the Nature Materials paper.